The simplest way to protect your SUP or surfboard! Why a SUP or Surfboard Lock? This lock system is a great, simple way to protect your investment ($$$$) in your surfboard or paddleboard. We know there are times when you'd like to leave your board unattended - it's outside, it's on your car's roof rack, it's behind your house - and many more times. Using this lock will deter would-be thieves who might like to walk off with your new surfboard or SUP, and will give you some peace of mind while you grab a cup of coffee, pick up a few groceries, or leave your board stored in your yard. a Dock Locks Jaw (looks like a car key). How does the Lock work? The surfboard and paddleboard lock works like a typical cable bike lock, but since a board doesn't have a place to loop a cable lock through (like a bike frame), the system includes a unique way to affix the lock to your SUP or surfboard, that's the Dock Locks Jaw. The Jaw is about the shape of a key. Its metal tip clamps open or shut, and clamps shut on your board in either of 2 places (leash plug or fin box, explained below). The trick is that when the cable lock is threaded through the metal loop of the Jaw, the Jaw's tip (clamped shut) cannot be opened. 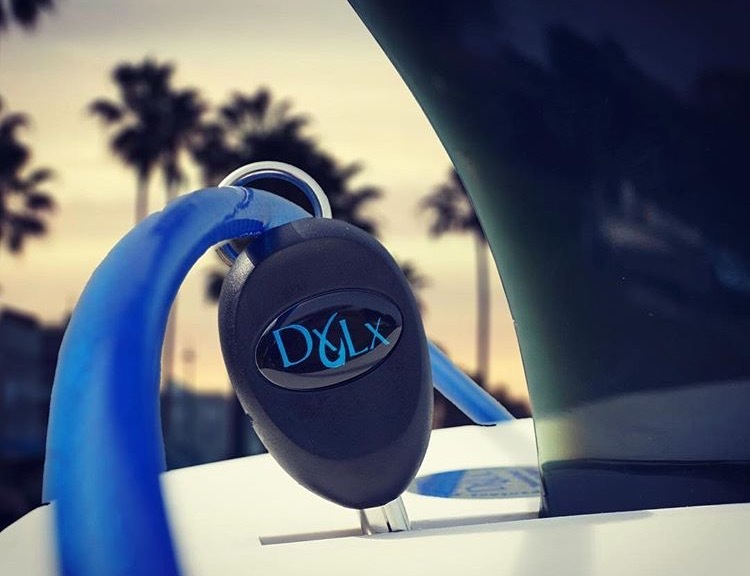 Together, the system prevents would-be thieves from removing the Jaw from your surfboard or paddleboard, and so can't remove your board from whatever the cable is locked to. Where do I clamp the Jaw to? Leash Plug: The easier and recommended of the two options, the Jaw can clamp shut around the leash plug at the rear of your paddleboard or surfboard. The leash plug is a sturdy part of your board built to withstand a lot of pressure (i.e. when you wipe out, and the water yanks your leash and your board) so it's not like a thief can easily pull the plug out. And pulling a plug out would do a lot of damage, another deterrent. Fin Box: This lock includes a third piece, a fin box adapter, that lets you attach your Locking Jaw to your board's fin box (SUPs and longboard surfboards), on the underside of your board where you attach your center fin. It's another strong part of your board designed to withstand a lot of force, which is why it's another ideal spot to lock to. The adapter itself is a small metal piece that you slide into your fin box and tighten. Our video on this page shows the details on how to use the Fin Box adapter. How do I lock multiple paddleboards or surfboards together? A great feature of this Lock system is that you only need one cable to lock up multiple boards. You do, however, need multiple Jaws, which you can choose to add at checkout. Clamp separate Jaws to each board, then thread the same cable through all the Jaws, and finally lock the cable to something strong. This is a practical, functional lock solution for multiple surfboards like surfboard rental shops, SUP yoga studios, storing your boards outside, and when you have multiple SUPs or surfboards on your car's roof rack. But remember, the cable lock is only 10 feet long, so if you are locking a lot of boards together, at some point you'll need more than 1 cable lock, too. Shortboard Surfboards and Surfboards with a Leash Plug: Slide the plastic housing up the stainless steel shaft and open the DXLX jaws. Locate the leash plug on your board and attach the DXLX jaws around the leash plug bar. Slide the plastic housing back down the shaft, so that the ring on top is fully exposed. Slide the coated DXLX cable through the ring at the top of the jaws. The jaw will swivel, making sure no damage is done to your board while locked. Attach the cable around any stationary object and insert the cable into the combination housing. Use DockLocks to lock your board at the beach or on your roof racks. Longboards and SUP (Paddleboards): Remove your fin from the fin box in your longboard or SUP. Locate the DXLX fin box cleat and place it on top of the fin box. Slide the fin box cleat into the notches on the top of the fin box and down to the track on the bottom of the fin box. Based on how your fin sits in the box, slide the cleat to either the front or back of the fin box. Based on how your fin sits in the box, slide the cleat to either the front or back of the fin box. Tighten the one-way tension screw with a flathead screwdriver. Because it is a tension screw, no damage will be done to your board. Replace the fin into your fin box. Attach the DXLX jaw around the bar on the cleat, which is now installed on your board. Your Dock Lock looks great. One question though - suppose I have the SUP in a SUP bag on my roof. Is there a way to lock it still? Dock locks are a great SUP locking system -- to use with a bag, you could run the cable out of a small opening in the zipper of the bag, and secure it to roof rack. An alternative would be using locking tie down straps for your SUP -- for a bag you could thread the locking straps through the bag's handle too. Does an extra "locking jaw" come with an extra "fin box cleat" ? Extra Dock Law Jaws do not ship with an extra cleat; you can order extra fin box cleats here. Does the lock work on windsurfing boards?Does the lock work on kiteboarding boards? You can use these board locks on your windsurfing board if it has a standard fin box piece or leash plug piece that the lock can attach to. If you check out the video posted on this listing, it shows how you can use a fin box or a leash plug to attach the jaw clamp. If you have either of those on your windsurf board, they should work fine. 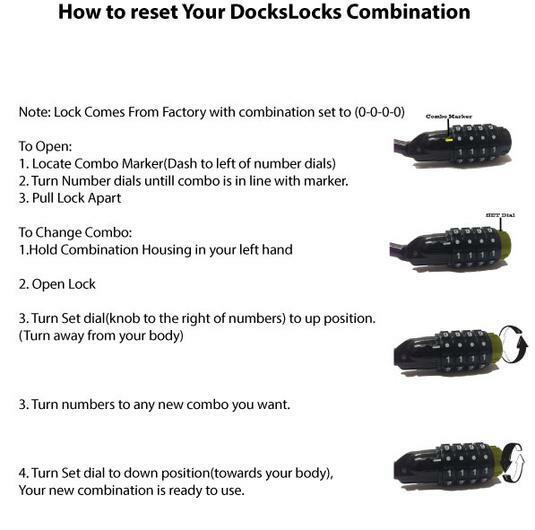 For your kiteboard, you would use this version of the dock lock system: Kiteboard Lock. It includes a cleat that you use to attach the jaw clamp to your kiteboard's bindings. I have a Yolo SUP board with the pop up handle. Will your lock work by threading thru the pop up handle? It is advertised by Yoloand. Other boards with this patented pop up to make locking your board to card roof rack and car frame using cable locks systems . Ourdock locks cablewill work to thread through your pop-up handle. In addition, it includes a jaw clamp that will secure the lock to your board's leash plug or fin box, if needed, as the dock lock system is designed to use that jaw clamp to secure the cable to your board. Does the ankle leash have to be removed in order to attach your key jaw? Yes, you would need to remove the ankle leash in order to attach this SUP/Surfboard Locking System's jaw clamp to the leash plug in order to use it. The alternative way to attach the locking clamp to your board is to the fin box, using the fin cleat that is included with the locking system. This system is so easy to use. I'm not the most mechanically inclined girl but I took the system out and had my boards secured in 10 minutes. The longest part was carrying the boards out and picking a lock code. When I put my SUP's in their racks, they are laying flat on their tops (meaning the fin is pointing up). When I put the dongle on the leash pin, it will automatically fall off as the weight of the dongle pulls it downward. You might want to consider having the dongle 'snap' into open and closed positions manually so that you can put the dongle on at any angle and it's on, then just put the cable thru it. Without a mechanical snapping function, you have to have the cable through the dongle to keep it engaged with the board. While not a huge issue and something I can do with two hands and some patience, if the dongle worked as I described, it would be a lot easier to use. I'm also locking up 4 boards so ease of use improvement for one installation would greatly improve my usage on the 4 boards when I rack them all. This is a great product. Not thief proof, but nothing is going to be if they really want your board. This little system will halt the walk off thief. Oddly the cable itself looks relatively imposing, then you get to the pseudo car key gizmo thing which while clever how it works, I do not believe would take much to snip it off. A person could probably thread a key ring holder on their board and get the same effect but this is more convenient. Obviously not going to stop a guy in board shorts with a pair of bolt cutters but then again those are hard to hide in your board shorts so your board is probably safe. This is so easy to use and gives me peace of mind that my investment is protected. Living aboard, enjoying water toys and wanting these accessible leads to storing these items "outside". Being able to lock these up while being gone for days or weeks gives me a bit more peace of mind. Pretty nifty device. Works just as advertised.